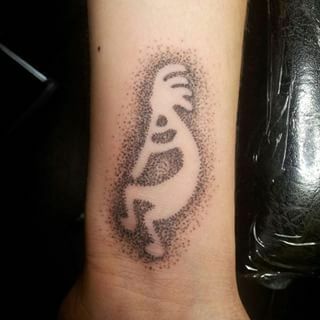 Kokopelli originally named as aka kokopelli who is according to tribes in south western Americans called the Hopi considered him as a God of fertility and climatic changes some also say that he is responsible for agricultural growth too. 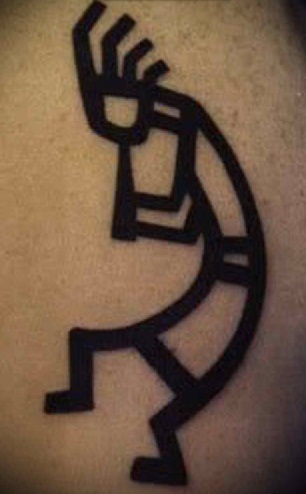 He is featured as a hunchback person with a flute character; this popular figure has now become a trendy tattoo design. 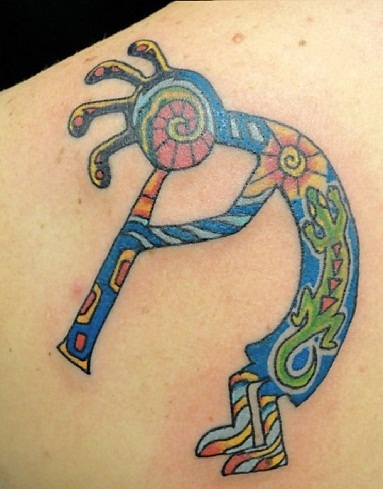 To know more about the kokopelli tattoo designs which articles put forth the top 9 kokopelli tattoo. The native people of south western Americans preserve the tribal belief through this colorful multicolored kokopelli face tattoo design which is done with utmost perfection. The inside design of this tattoo design is made more artistic with lizard picture around the body and the head is drawn like a snail. 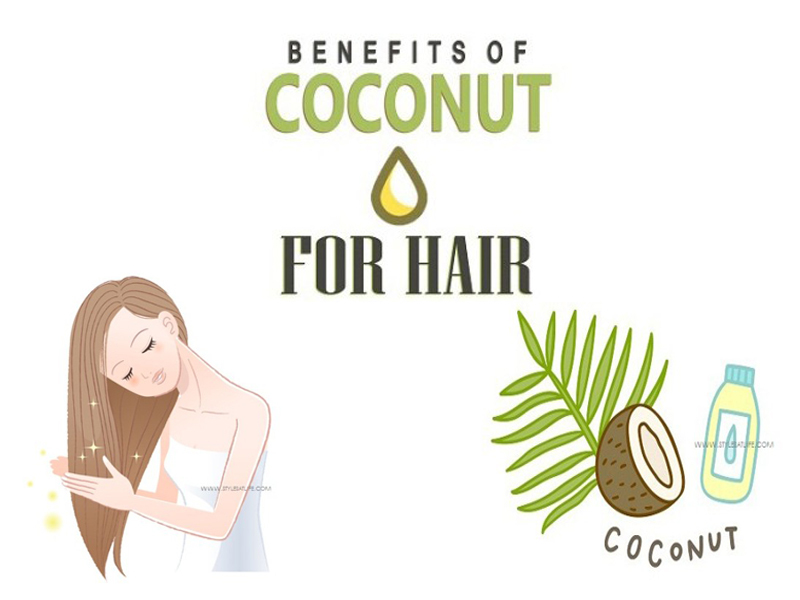 This one is suitable for girls too. For those who like to have a simple tattoo design, then this is an ideal one. 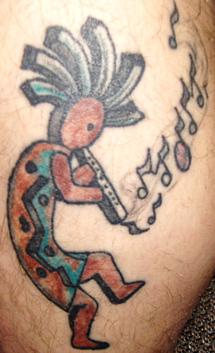 The Kokopelli figure is bought out using black dots which have the hunchback and a flute in his hands facing downward. If you planned for little different style of pattern, then you can try this anytime, you will get good comments on your this style of design. 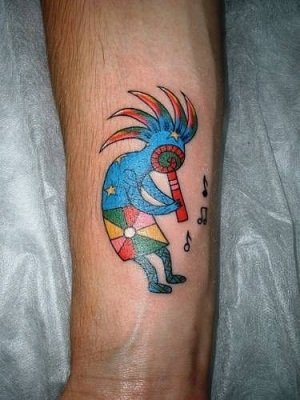 Flute singing Kokopelli which is designed with musical notes flying out if the flute. This artwork needs a good amount of experience and patience. 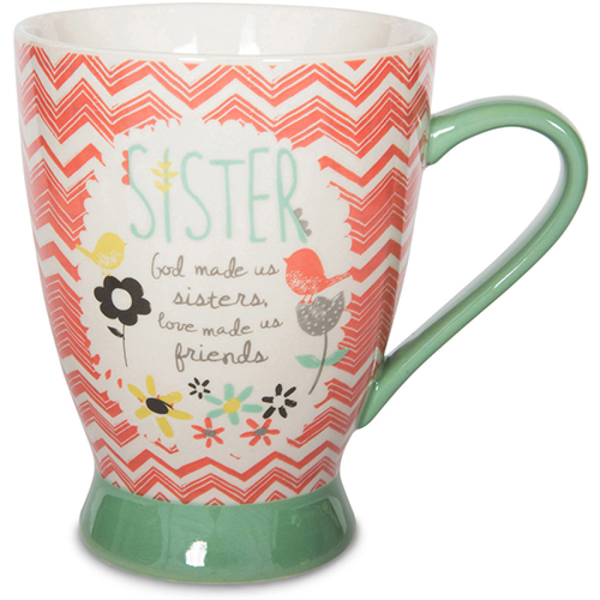 This tattoo suits well as an arm or an ankle tattoo design for both girls and boys. 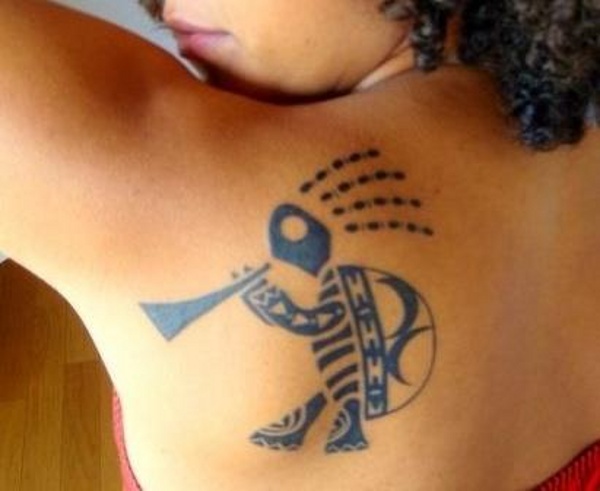 As we know the fact that Kokopelli deity has been originated from tribal age, in due remembrance and respect designers came up with a tribal style Kokopelli tattoo. 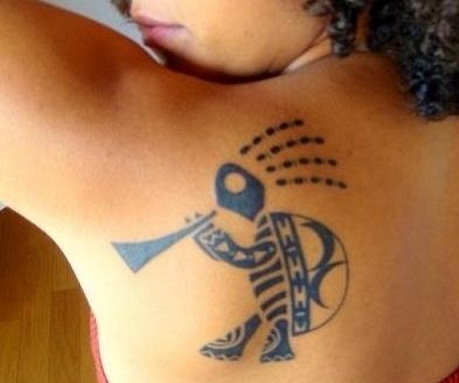 The dress of the Kokopelli is designed how in early tribal people use to dress them. This type of tattoo design is a funky artwork. 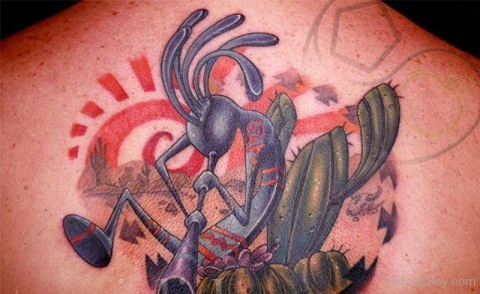 As Kokopelli signifies agricultural benefits too, this concept was used in designing the cactus backdrop tattoo design. The cactus color is painted with mild green paint which is the original color. Turtle an example setting amphibian is used in creating an artistic tattoo design. The tattoo is designed turtle as a base which has a hunched back look. The turtle tattoo design is quite famous among young generation who like animal print tattoo design. 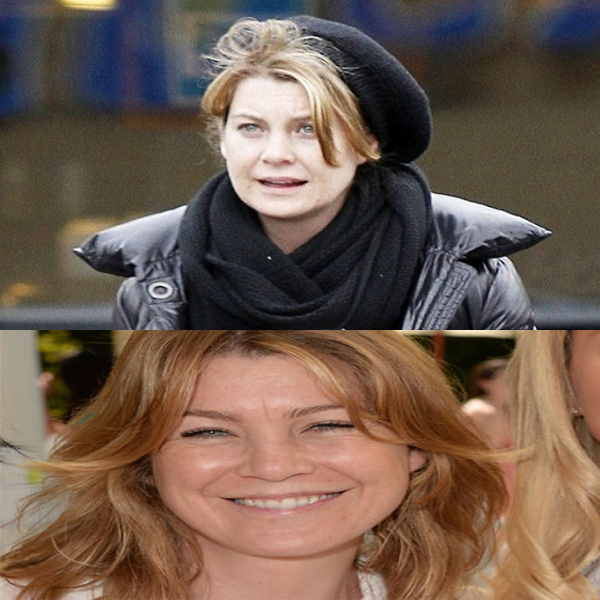 It shows the personality of your attitude. 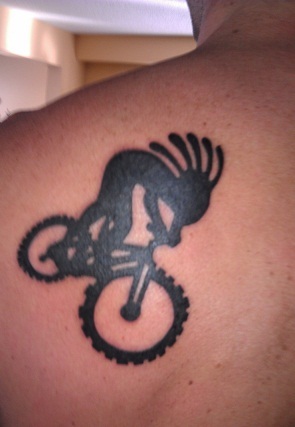 This type of Kokopelli tattoo design is a cute small tattoo design which includes bicycle as the base in which kokopelli character is drawn. This is a typical arm tattoo design. 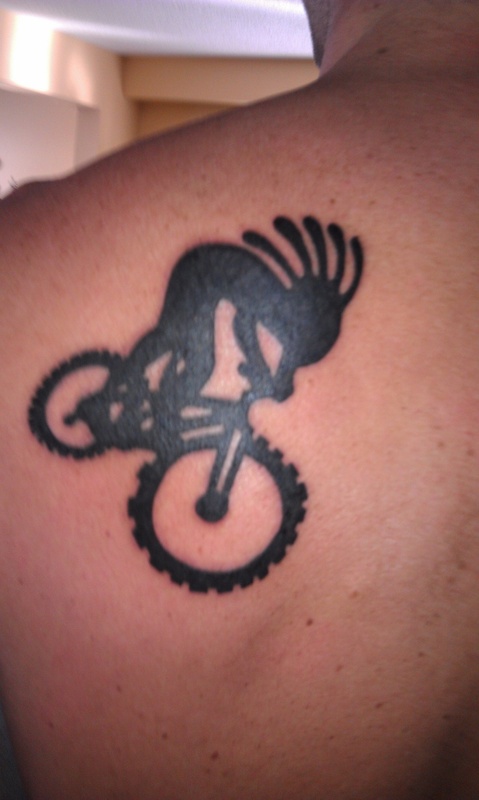 The bicycle is also painted in black ink like the Kokopelli. A simple tattoo design can talk beauty without any jazzy color; this concept is used in designing this simple line tattoo design. This simple line tattoo is designed without flute with a sad face. Such design for those who like to simple, but it has a classic style pattern in this structure. 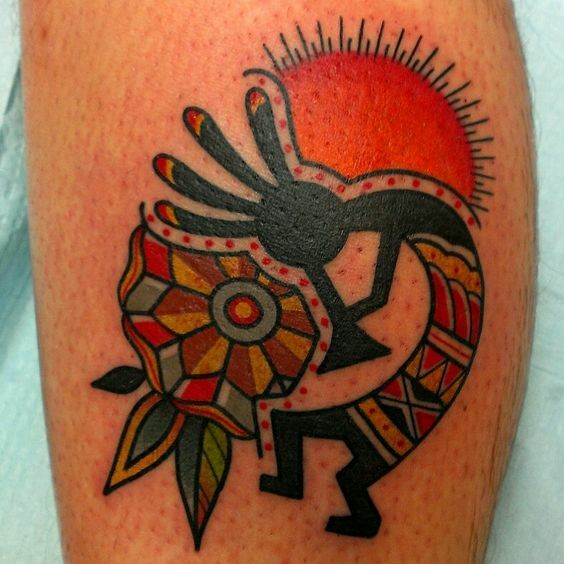 Dancing Kokopelli tattoo design is an interesting tattoo type which is designed more colorfully with a sunrise design inked on the back. The legs are designed with a dancing move. This tattoo is a good back shoulder tattoo design. Kokopelli tattoo design is considered as an aspiring tribal tattoo design along with modern ideology used in drawing this tattoo in various types. Trying one of the above type of tattoo design can give a different feel from the usual tattoo design.